The Medicine Place Pharmacy is your one-stop shop, specializing in prescription processing and medical supply delivery. The Medicine Place came to Sweetwater, Texas in August 1984. The original Wayne’s Pharmacy in Roscoe, Texas was purchased by Trevlyn Kelley and moved to Sweetwater. The Medicine Place was located at 1008 Lamar Street from August 1984 to May 2007, using an apothecary format – dispensing prescriptions and recommending over-the-counter (OTC) needs. The Medicine Place Sweetwater was purchased by Ted and Amy Basye in May of 2002. 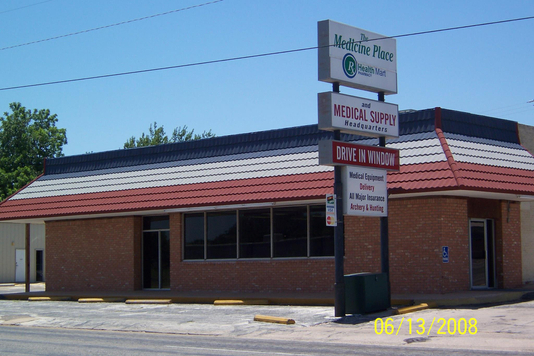 The Medicine Place Inc. purchased Rolling Plains Pharmacy from Mike Staton family Limited Partnership in May 2007. The business expanded to include medical supplies at that time. Outdoor hunting supplies and gift selections were soon added. Today at the Medicine Place customers are able to shop in a blend of the “old-fashioned” coupled with “state-of-the-art.” The Medicine Place is 4-in-1. First, we are a pharmacy incorporating “state-of-the-art” robotic technology and computerization in our prescription filling processes. We are also a PCCA trained compounding pharmacy with the ability to custom-made medications for special needs including hormone replacement, thyroid, dermatological preparations, certain discontinued products, etc. Second, we have a durable medical supply department providing home health products including concentrators, hospital beds, bathroom chairs and hangers, braces, and support devices, wheelchairs, walkers, diabetic shoes, crutches, and canes. Third, we handle a wide variety of gift items – crosses and candles, housewares, purses, bags, jewelry, home décor items, children’s games, and novelties. There are gift registry options available for bridal and baby showers as well as graduation. Fourth, we are Basye Boys Outdoor – carrying archery and hunting equipment.